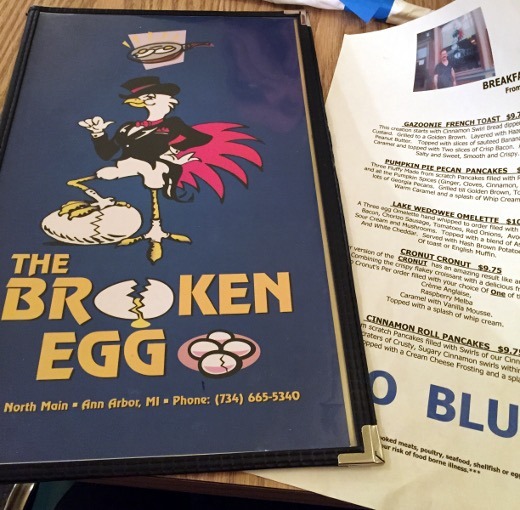 A few weeks ago I visited The Broken Egg, a café located on Main Street in downtown Ann Arbor, for the second time ever. My first and only other visit was actually back in 2010. I just wasn’t thrilled by the initial experience enough to seek it out again, until recently. What changed, you ask? Well, Cinnamon Roll Pancakes. CINNAMON ROLL PANCAKES. Yes. Saw I picture of these on social media (probably from an Instagram friend; I don’t even remember for sure), showed the huz, and we both agreed that we needed to visit ASAP. So we popped into The Broken Egg on a busy Saturday morning for brunch. The wait both to order our food and to get our food was very long and kind of annoying, so there’s that. 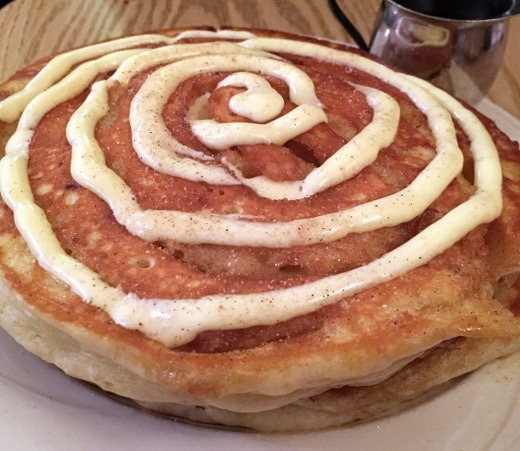 But finally, we were delivered our order of Cinnamon Roll Pancakes, as featured on the Specials menu (please note that I am not sure if they are still available, since they were a daily special). 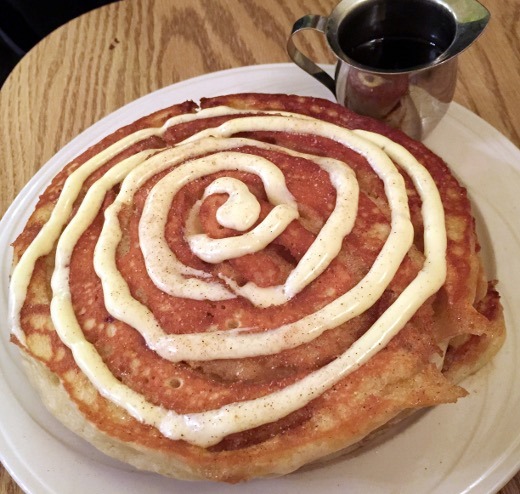 The pancakes featured swirls of cinnamon roll dough in the pancake batter and were topped with swirls of cream cheese icing. The pancakes themselves were good – not as sweet and cinnamon-y as I had imagined they might be. But that cream cheese icing? It was EVERYTHING. We both agreed that much more icing was needed – perhaps another layer in the middle of the pancake stack. So all in all, the pancakes were fine, but just not as rich and indulgent as we expected them to be with a name like Cinnamon Roll Pancakes. I expected them to be crusted in sugar, dripping in butter, and oozing with icing, but they were a bit more modest. Probably better for my waistline! The huz and I went halfsies on the Cinnamon Roll Pancakes and on an omelet so we could get the best of both worlds – sweet and savory. This Lake Wedowee Omelette was very good and we both enjoyed it. 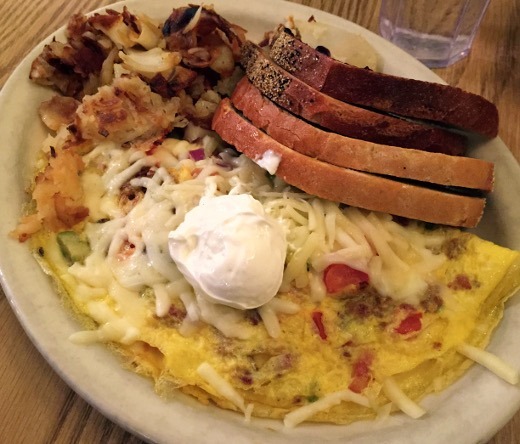 In the future, I’ll probably leave The Broken Egg to those Ann Arborites who live near downtown and stick with Nick’s Original House of Pancakes for most of my brunch needs, which is closer to my home and whose food I like better than The Broken Egg. I do love me some Nick’s! I think I read somewhere that there is a connection between the owners of these two places (possibly the same?) Anyone know if this is the case?